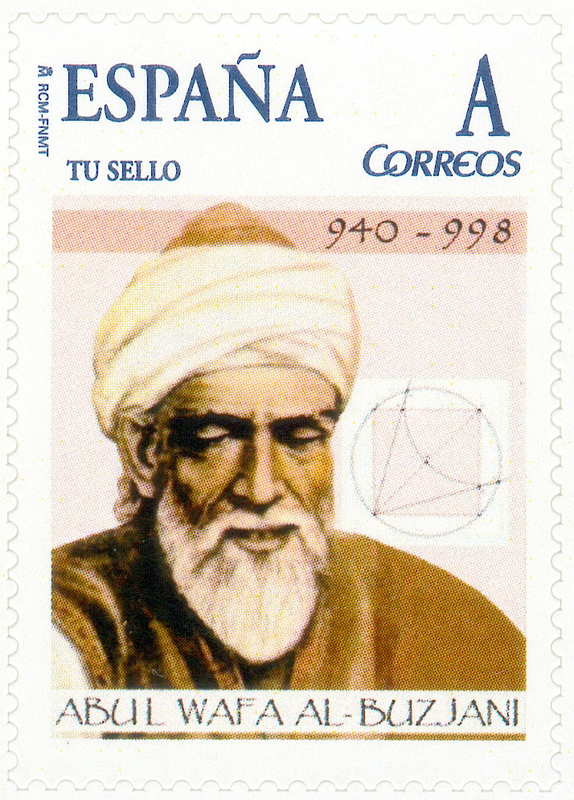 Muḥammad Abūʾl-Wafāʾ al-Būzjānī (10 June 940–997 or 998) was a distinguished Muslim astronomer and mathematician, who made important contributions to the development of trigonometry. He worked in a private observatory in Baghdad, where he made observations to determine, among other astronomical parameters, the obliquity of the ecliptic, the length of the seasons, and the latitude of the city. In honour of his astronomical work, a crater on the Moon was named for him. His 1073th anniversary falls this June 10th. Fig 1. Artistic depiction of Muhammad Abu al-Wafa in a Spanish stam. (Source). ​Abu al-Wafa (or Abu al-Wafa’) al-Būzjānī was one of the leading astronomers and mathematicians of the Islamic scientific tradition, with significant contributions in observational astronomy. His achievements in trigonometry paved the way for more precise astronomical calculations. He was born Born in Būzjān or Būzhgān (Khurāsān, Iran) on 10 June 940, in the region of Nīshāpūr, located now in Khurāsān, Iran. He was from an educated and well‐established family. Abu al-Wafa flourished in an age of great political upheavals. The Būyids (reigned from 945 to 1055), a family originally from the highlands of Daylam in northern Iran, had established a new dynasty that soon extended its rule over Iraq, the heart of the ʿAbbāsid caliphate, reducing the caliph's rule to a mere formality. Under the Būyids, who were great patrons of science and the arts, many scientists and scholars were attracted to Baghdad to enjoy the benefits of the new rulers' patronage. The change in the political climate had brought with it a great cultural revival in the eastern Islamic lands, promoting literary, scientific, and philosophical activities on a large scale. At the age of 20, Abu al-Wafa moved to Baghdad where he soon rose to prominence as a leading astronomer and mathematician at the Būyid court, conducting observations and research in the Bāb al‐Tibn observatory. The decade following 975 seems to have been his most active years in astronomy, during which he conducted most of his observations. Later, to comply with the wishes of the Būyid regent Sharaf al‐Dawla, who was himself a learned man with keen interest in astronomy, Al-Būzjānī became actively involved in the construction of a new observatory in Baghdad. His collaborator was Al-Kūhī, another celebrated astronomer, who excellent in mathematics, physics and in making astronomical instruments. The astronomical work of Al-Būzjānī and his colleagues in Baghdad mark the revival of the “Baghdad school,” a tradition with much vitality in the preceding century. "Today’s doodle honors this man, an innovator whose contributions to science include one of the first known introductions to negative numbers, and the development of the first quadrant, a tool used by astronomers to examine the sky. 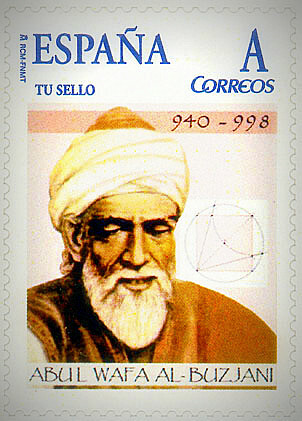 His pioneering work in spherical trigonometry was hugely influential for both mathematics and astronomy..."
Abu al-Rayhan al-Bīrūnī, the renowned astronomer and scientist living at that time in Kath (in central Asia), tells us of his correspondence with Al-Būzjānī, who was in Baghdad. In 997, the two astronomers prearranged to make a joint astronomical observation of a lunar eclipse to establish the difference in local time between their respective localities. The result showed a difference of approximately one hour between the two longitudes, very close to present‐day calculations. Al-Biruni made numerous references to Al-Būzjānī's measurements in his various works. 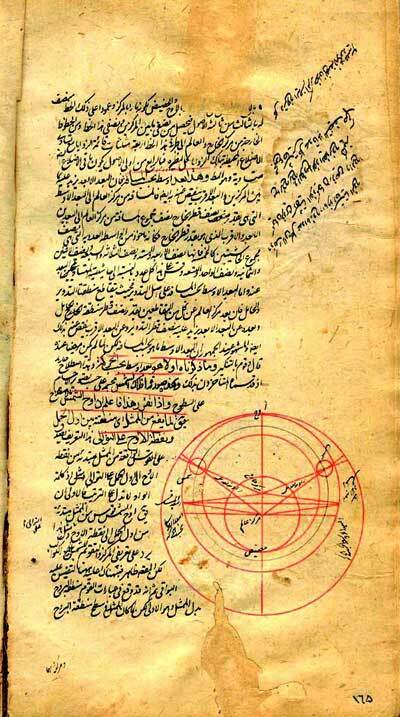 Al-Būzjānī's principal astronomical work, and his sole extant writing on the subject, is Kitāb al‐Majisṭī, which was edited and translated in 2010 by Ali Musa. The book consists of three chapters: trigonometry, application of spherical trigonometry to astronomy, and planetary theory. Although Kitab al‐Majisṭī did not introduce considerable theoretical novelties, it contains observational data that were used by many later astronomers. Its section on trigonometry was a comprehensive study of the subject, introducing proofs in a masterly way for the most important formulas in both plane and spherical trigonometry. Abu al-Wafa’s approach, at least in some instances, bears a striking resemblance to modern presentations. Fig 3. Page of the manuscript of Kitab al-majisti by Abu al-Wafa. (Source). In this book, Al-Būzjānī introduced for the first time the tangent function and hence facilitated the solutions to problems of the spherical right‐angled triangle in his astronomical calculations. He also devised a new method for constructing the sine tables, which made his tables for sin 30′ more precise than those of his predecessors. This was an important advance, since the precision of astronomical calculations depends upon the precision of the sine tables. The sine table in Al-Būzjānī's Almagest was compiled at 15' intervals and given to four sexagesimal places. In the sixth chapter of the book, Al-Būzjānī defines the terms tangent, cotangent, sine, sine of the complement (cosine), secant and cosecant, establishing all the elementary relations between them. In mathematics, Abu al-Wafa’s contributions cover both theoretical and practical aspects of this science. His practical textbook on geometry, A Book on Those Geometric Constructions Which Are Necessary for a Craftsman (Kitab fima yahtaju ilayhi al-sani’ min ‘ilm al-handasa), is unparalleled among the geometrical works of its kind written in the Islamic world. He wrote also a practical textbook on arithmetic, the Book on What Is Necessary from the Science of Arithmetic for Scribes and Businessmen (Kitab fima yahtaju ilayhi al-‘ummal wa-‘l-kuttab min ‘ilm al-hisab). On the basis of works attributed to him, Al-Būzjānī seems to have been a prolific scholar. He is said to have written 22 books and treatises. These include works on astronomy, arithmetic, and geometry, as well as translations and commentaries on the algebraic works of past masters like Diophantus and Al-Khwārizmī, and a commentary on Euclid's Elements. Of all these works, however, we know of only eight which have survived. Of his astronomical works, references were made to a Zīj al‐wāḍiḥ, an influential work that is no longer extant. Historical evidence, as well as the judgments of Būzjānī's colleagues and generations of scholars who came after him, all attest to the fact that he was one of the greatest astronomers of his age. He was also said to have been a man with great moral virtues who dedicated his life to astronomy and mathematics. His endeavors in the domain of science did not die with him. In fact, the data he had gathered from his observations were used by astronomers centuries after him. Furthermore, the science of trigonometry as it is today is much indebted to him for his work. Fig 4. Front cover of Majisti Abi al-Wafa’ al-Buzgani by Ali Musa, Beirut: Markaz dirasat al-wahda al-‘arabiyya, 2010. - Al‐Qifṭī, Jamāl al‐Dīn (1903). Taʾrīkh al‐ḥukamāʾ, edited by J. Lippert. Leipzig: Theodor Weicher. - Carra de Vaux (May–June 1892). “L'Almageste d'Abū ʾl Wéfā Alboūzdjānī.” Journal asiatique, 8th ser., vol. 19: pp. 408–471. - Debarnot, Marie‐Thérèse (1996). “Trigonometry.” In Encyclopedia of the History of Arabic Science, edited by Roshdi Rashed. Vol. 2, pp. 495–538. London: Routledge. - Ghorbani, A. and M. A. Sheykhan (1992). Buzdjānī Nāmeh: The Biography and a Survey of Buzdjānī's Mathematical Works. Tehran: Enqelab‐e Eslami Publishing and Educational Organization. - Hashemipour, Behnaz, “Al-Būzjānī,” in Thomas Hockey et al. (eds.). The Biographical Encyclopedia of Astronomers, Springer Reference. New York: Springer, 2007, pp. 188-189. - Ibn al‐Nadīm (1970). The Fihrist of al‐Nadīm: A Tenth‐Century Survey of Muslim Culture, edited and translated by Bayard Dodge. 2 Vols., Vol. 1, p. 83. New York: Columbia University Press. - Kennedy, E. S. (1984). “Applied Mathematics in the Tenth Century: Abu ʾl‐Wafāʾ Calculates the Distance Baghdad–Mecca.” Historia Mathematica 11: 193–206. - Kennedy, E. S. and Mustafa Mawaldi (1979). “Abū al‐Wafāʾ and the Heron Theorems.” Journal of the History of Arabic Science 3: 19–30. - Medovoi, M. I. (1960). “On the Arithmetic Treatise of Abū ʾl‐Wafāʾ.” Studies in the History of Mathematics, vol. 13: pp. 253–324. - Saidan, Ahmad S. (1974). “The Arithmetic of Abū ʾl‐Wafāʾ.” Isis, vol. 65: pp. 367–375. - Sesiano, Jacques (1998). “Le traité d'Abū ʾl‐Wafāʾ sur les carrés magiques.” Geschichte der Arabisch‐Islamischen Wissenschaften, vol. 12: pp. 121–244. - Suter, H. (1960). “Abu ʾl‐Wafāʾ al‐Būzadjānī.” In Encyclopaedia of Islam. 2nd ed. Vol. 1, p. 159. Leiden: E. J. Brill. - Youschkevitch, A. P. (1970). “Abū ʾl‐Wafāʾ al‐Būzjānī.” In Dictionary of Scientific Biography, edited by Charles Coulston Gillispie. Vol. 1, pp. 39–43. New York: Charles Scribner's Sons.